Addition Regrouping Games For Teacching Addition. You might like some Addition Regrouping activities and games to add your teaching tool box. Help kids see what's really going on with manipulatives or pictures. I provide some Ones and Tens Blocks for you to print. Every time they have ten unit blocks, they need to trade them in for a tens block. Okay, did they get it? Good. Now, let's have a look at some numbers using our unit blocks and tens blocks. The picture below shows how we represent the number 28 using our manipulative blocks. So we have two ten blocks that equal twenty on the left. And in the right column we have eight unit blocks. So this gives us a total of 28. 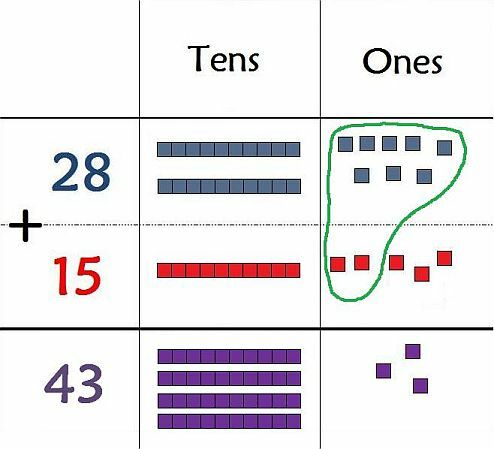 Be sure your students or child understand how our ten blocks and unit blocks represent the number 28 here before moving on to the addition regrouping activities below. 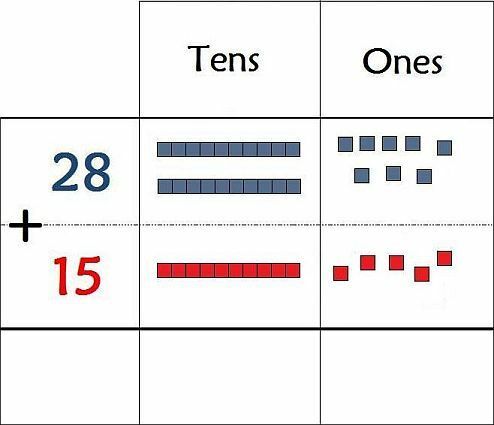 Now for the 28, we need to put two tens blocks in the tens column and eight unit blocks in the ones column. This gives us a total of 28. 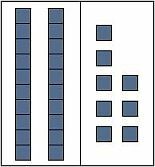 Underneath that row, for the fifteen, we put one tens block in the tens column and five unit blocks in the ones column to total 15. And now we're ready for to add the two numbers together and get the sum. And that's what you see pictured below. And now, are you ready to add them up. That's what we have in the picture below. That's what we have in the picture above. Notice we circled 10 unit blocks in the ones column so we could trade it in for a tens block. So now there are 4 tens blocks and only 3 ones blocks for a total of 43.